Armstrong Series S & H in-line circulators are suitable for applications such as hydronics heating and cooling, domestic water systems, multistage zoning and general industrial service. Both models are available in a wide range of sizes to match the performance requirements of any of these applications. Armstrong Series S & H circulators are durable and trusted products that have been used by HVAC professionals for decades. Armstrong Series H in-line circulators are built using a standard three-piece design that features a radially-split body, oversized shaft, centrifugal impeller, positive mechanical seal and modular construction. The radially-split body can be left in line while servicing the pump, eliminating cumbersome disconnecting of pipes. Armstrong circulating pumps have oversized shafts made from special alloy steel, machined to exacting tolerances. Shafts have integral thrust collars, heat-treated to provide long life under severe working conditions. The balanced, centrifugal-design impeller ensures maximum water delivery in the HVAC system. A proven method of preventing water leakage, the well known ARMseal construction is a frequently imitated feature of the Armstrong circulator. Made from long lasting hard-wearing materials, it ensures many years of noise-free, trouble-free service. Models H-32 through H-54 feature a unique Armstrong shaft and bearing module which fi ts all of these models for ease of serviceability and reduced inventory costs. Note GPM (Gallons Per Minute) flow rates are determined by head pressures and restrictions. The max flow rate is with no head pressure and no restrictions. The Armstrong ASTRO series circulators has been improved with the NEW ASTRO 2 series. Please note that the new series pumps do not retro fit with the old series and have different dimensions. You can view the ASTRO 2 pdf file here. Over/under estimated system resistance in the original design. Increased number of zones due to a building addition. Addition of system elements such as an indirect hot water tank or spa. With Astro 2 3-speed units installed you can easily change the operating speed to handle these changed performance requirements. Lead-free bronze and stainless steel models of Astro 2 certified <0.25 weighted average percent lead and complies with California Health and Safety Code Section 116875 (commonly known as AB1953). Astro 2 units are ETL listed for the US and Canada and conform to UL std. 778 and Canadian electrical safety standards CSA std C22.2 No 108-01. Reduce your inventory with a variety of performance curves. Ten pumps replace 93 circulators. Correct design issues in the field by adjusting the circulator output. The Armstorng ASTRO Express Hot water Delivery System provides instant hot water at the tap where the Express valve is located. The system includes an Astro 220 SSU w/timer & 6 ft. Line cord, union hardware kit, Astro Express LF Valve. Featured pumps for in home recirculation. Pumps with the TA suffix come with the timer and Aquastat. Great for hot water recirculation. Flow Factor also has Armstrong Union and Flange sets for all their pumps. Please view the complete Armstrong ASTRO 2 listing here. Armstrong S Series circulators feature the unique Armstrong shaft and bearing module for ease of serviceability and maximum interchangeability. Oversized shafts of alloy steel machined to exact tolerances. Impellers are constructed from non-ferrous material and are designed for optimal water delivery. Available in bronze-fitted and all-bronze construction. CAST IRON CICULATORS ARE USED WITH BOILERS AND OTHER NONPOTABLE circulation applications. Armstrong Series S pumps can be used in HVAC, Hydronic, commercial and light industrial applications. Please call Flow Factor at 866-360-9830. Pumps and Drives for Flow Control from Flow Factor. We carry a variety of Armstrong Astro Circulators, including Bronze body pumps for potable water (domestic drinking), Iron body pumps for service water (boilers), and Bronze body pumps with Timers and an Aquastat option for hot water recirculation. Armstrong Astro hot water recirculation systems automatically circulate water through domestic hot water distribution pipes. This helps to ensure that everyone in the household has "instant" hot water at the tap when they need it, while also helping to conserve water and save water heating energy costs. Aquastat equipped models help save even more energy. 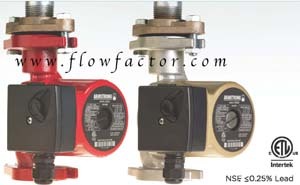 Also the Armstrong Light Commercial and Residential circulators, Series S and H are available at Flow Factor. Both S series and H Series Armstrong circulators feature the unique Armstrong shaft and bearing module for ease of serviceability and maximum interchangeability. Oversized shafts of alloy steel machined to exact tolerances. Impellers are constructed from non-ferrous material and are designed for optimal water delivery. The Armstrong Series S and H are available in bronze-fitted and all-bronze construction. Coming Soon, the Armstrong PiB or Pump-in-a-Box to Flow Factor. The PiB series builds on the high quality and unsurpassed performance you've come to expect from Armstrong. PiB (Pump-in-a-Box) models are packaged for warehouse distribution and, for a large selection of sizes, guaranteed for delivery within 72 hours of order. All other sizes are delivered seven working days from order. Current PiB offerings include the Armstrong 4380 single head in line range in fixed speed and Intelligent Variable Speed (IVS) Sensorless versions and the Armstrong 4392 twin in line range in fixed speed and IVS Sensorless versions. The offering covers an extensive range of predetermined impeller and motor combinations, covering a wide range of head and flow requirements. Flow Factor Sells Adjustable Speed Drives by Toshiba for Pumps. The Toshiba P9 Drive has been newly designed exclusively for Pump Control. The Toshiba P9 adjustable speed drive is a revolution in pump control. By incorporating Toshibafs proprietary, ground-breaking Virtual Linear Pump (VLP) Technology, the P9 directly, precisely, and linearly controls pressure, temperature or flow. The Toshiba P9 eliminates many obstacles users thought were an integral part of pump control and sets a new standard in ingenuity, performance, and ease-of-use for the pump industry. The Toshiba P9 pump drives are available in 230 and 460 volts and from .75 HP to 400HP. The P9 drives can come with Assembly boxes with over load protection and bypass capabilities as well as dynamic braking, both Standard and Heavy Duty.